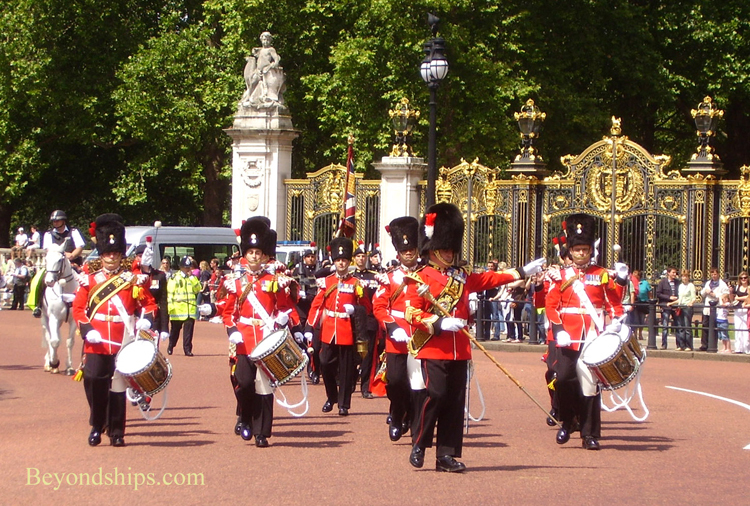 Most The Changing of the Guard at Buckingham Palace is the most popular place to see the Guards. Especially during the summer months, crowds gather well ahead of the ceremony and stake out vantage points along the iron fence in front of the forecourt of the Palace and along the route the Guards follow to and from their barracks. Around 11:00 a.m. things start to happen. Guardsmen appear and form up in the Palace forecourt. Then, around 11:30 more Guardsmen accompanied by a band arrive via the north central gate. There is quite a bit of marching interspersed with periods of standing about. All the time the band is playing both military marches and popular tunes. Finally, shortly after 12, the band and a group of the Guardsmen leave. The ceremony is over and the tourists depart. But what was really going on? As the name indicates, the ceremony is about replacing the contingent of soldiers who are on guard duty at the Palace with another contingent. The first group of soldiers that one sees are the ones who have been on guard duty. The large group that arrives with the band are the ones who are coming to relieve the ones who have been on duty. The first thing that happens after the new guard arrives is that the two groups pay military compliments to each other. This consists of marching and presenting arms. At the end, the two groups stand facing each other. Next, the captains of each guard march towards each other and go through the ceremonial handing over of the keys to the Palace. Responsibility for the safety of the Palace shifts to the new arrivals. They are now the Queen's Guard. The officers and NCOs salute the senior captain on duty (who is usually a major) with their swords and proceed to the Guardroom to do the actual handover. Meanwhile, two young officers are marching back and forth across the forecourt carrying flags. These flags are the regimental colours. In the old days, the colours were the rallying point for the troops in battle so it was important that everyone know what they looked like. Accordingly, they were shown on a regular basis. Today, these revered symbols are no longer carried into battle but the tradition of parading them remains. Officers not directly involved in the ceremony fall out and walk back and forth along the west side of the forecourt. Legend has it that this was originated in order to see how well the officers had recovered from any drinking done the night before but that is one of those tales. The captains of the guard go inside the Palace to see if there are any special orders for the day. This completed, a corporal leads a small number of Guardsmen from the new guard to each of the sentry boxes around the Palace, replaces the guard who is there and reads the orders of the day to the new sentry. The relieved sentries march to where the old guard is standing and form up. At 12:05, both guards are brought to attention. The guard that has just been relieved marches forward, turns and exits via the Center Gate accompanied by the band. The Changing of the Guard at Buckingham Palace is done daily May through July. It is done every other day the rest of the year. Official start time is 11:30 but if you want to actually see the ceremony (as opposed to just hear it), arrive early as it can become very crowded. Above: The St. James Palace detachment of the Queen's Guard forms up before marching to join their comrades at Buckingham Palace. 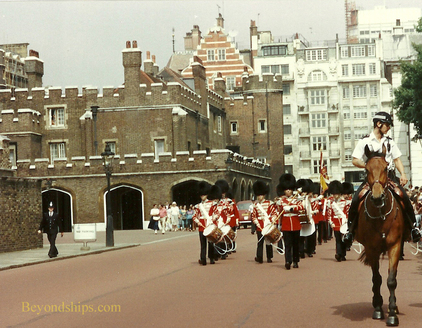 Below: The St. James Palace detachment moves out led by its Corps of Drums. 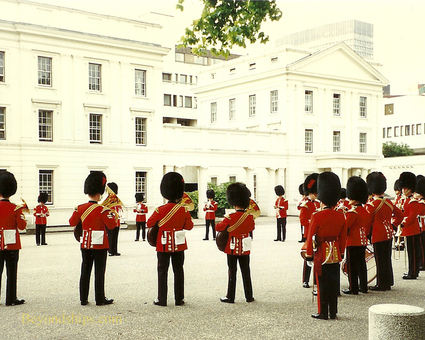 Above: The band performs in front of Wellington Barracks before accompanying the new guard to Buckingham Palace. Below: Even musicians are subject to inspection. Above: The Life Guards form up for the changing of the guard at Whitehall. 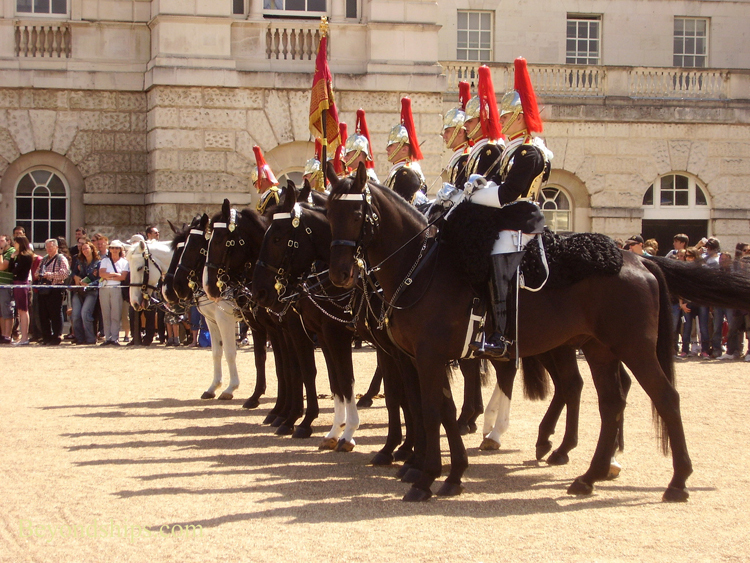 Below: Facing them is a contingent of the Blues and Royals. Above: Officers from the the two regiments meet in the middle and responsibility passes from the old guard to the new. 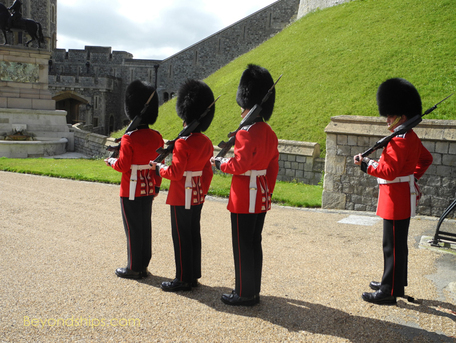 Below: Changing the sentries at Windsor Castle. Above: The Changing of the Guard ceremony in the forecourt of Buckingham Palace. Above: The Band of the Coldstream Guards leaving the Palace after the ceremony. Below: Behind the band are the Coldstream Guards who have just finished their guard duty. Above: When is a guard not a Guard? Sometimes when the Guards regiments are deployed elsewhere, other British Army regiments provide the guard detachment for the Palace. 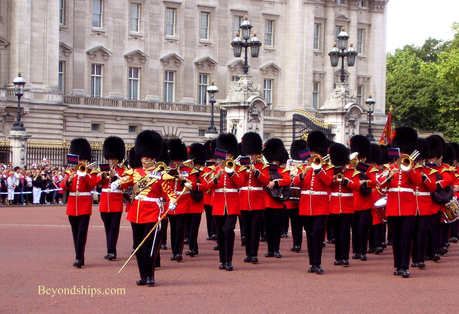 Below: The musicians can also be from other regiments. 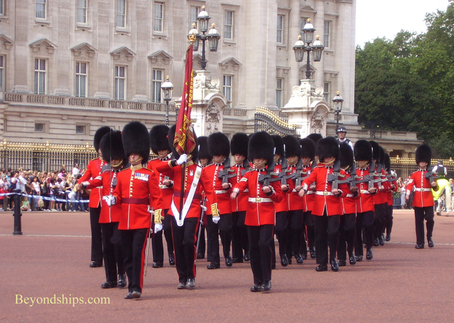 In addition to Buckingham Palace, you can see the Guards perform their ceremonial duties at a number of other locations nearby. First, there is St. James Palace. At 11:00 a.m. a detachment of the guard that has been on duty forms up in the Friary Court. It is inspected and accompanied by its Corps of Drums, marches up The Mall to Buckingham Palace where it joins with the main body of the old guard for the Changing of the Guard ceremony described above. Shortly after noon, this process happens in reverse. A detachment of the new guard leaves Buckingham Palace, marches down The Mall and forms up in Friary Court. 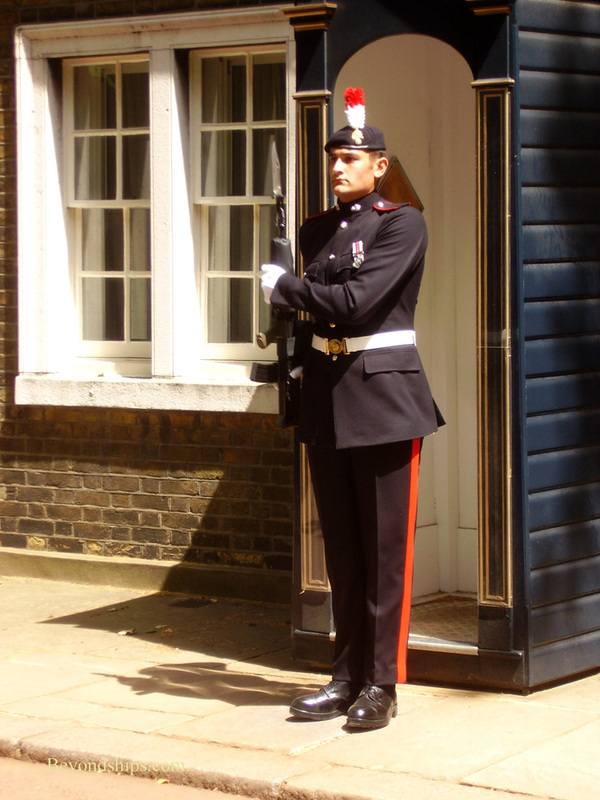 A corporal then leads a group of Guardsmen around to the various sentry boxes at St. James Palace to relieve the sentries. 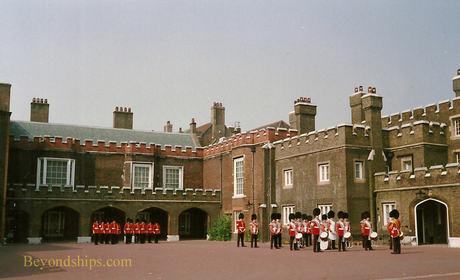 The ceremonies at St. James Palace are much less crowded than at Buckingham Palace. The police do keep spectators out of the courtyard but there is no fence between you and the ceremony. There are also photo opportunities as the Guards march along The Mall but be advised that they do march fast. 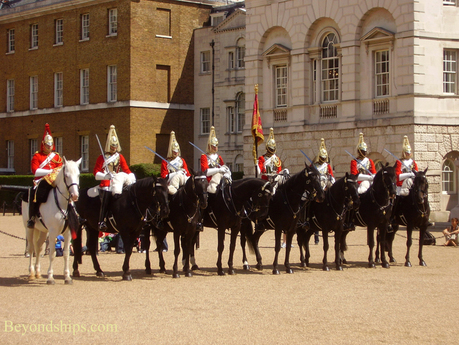 Another place to view the Guards is at Wellington Barracks along Birdcage Walk. The new Guard forms up in the courtyard there prior to marching to Buckingham Palace beginning around 11 o'clock. There is an inspection by the officers and NCOs. 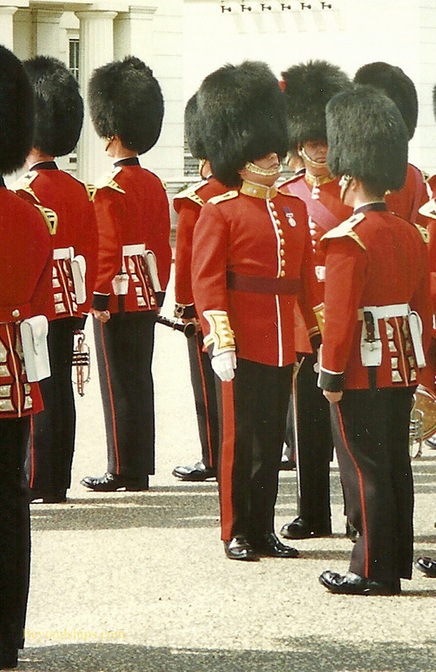 In addition, if you enjoy the precise style of the Guards musicians, this is a great opportunity to hear them as the band plays music throughout. The selections can range from classical pieces to West End show tunes and popular songs. At approximately, 11:30 a.m. the gate closest to the Palace opens and they march out, pass by the Victoria monument and into the Palace yard. It is particularity impressive to see the large group of soldiers and musicians go by in formation. If the Scots Guards or Irish Guards are involved, there will also be bagpipes. A fence does separate Wellington Barracks from Birdcage Walk but you can still get a good view of the action. Once again, it is much less crowded than the Palace itself. So far, we have only talked about the Foot Guards. What about the Household Cavalry? The cavalry does sentry duty at Whitehall at the opposite end of St. James Park from Buckingham Palace. This was where the monarch lived in the 1600s and the Life Guards had responsibility for safeguarding the place. 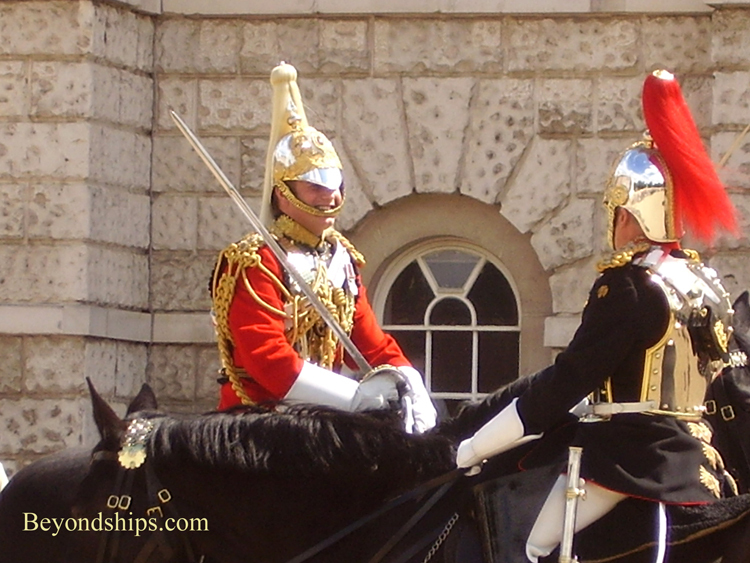 Although the monarch has long since moved, the Household Cavalry's guard duty remains. During the day, mounted sentries stand half in the large sentry boxes by the front gate and half on the sidewalk that runs along the busy street. You walk up quite close to their sentry boxes but as the sign warns, the horses have been know to kick and bite. The ceremony of changing the guard at Whitehall takes place at 11 a.m. usually in the large parade ground, known as Horse Guards Parade on the side of the building closest to St. James Park. Upon arrival, the new guard forms up in a line facing the old guard. They exchange salutes. Sentries from the new guard ride through the archway that connects the parade ground with the forecourt of the building and on to the sentry boxes in front. Those sentries who have just been relieved join up with the old guard. The old guard salutes the new and rides away down The Mall. The cavalry units do not bring their musicians along so this ceremony is not as entertaining for the ear as the foot guards ceremonies. However, the sight of these armored warriors on their black steads is unforgettable. Once again, it is not as crowded as the Palace ceremony and you can get much closer to the action. The Guards are also at the Tower of London. 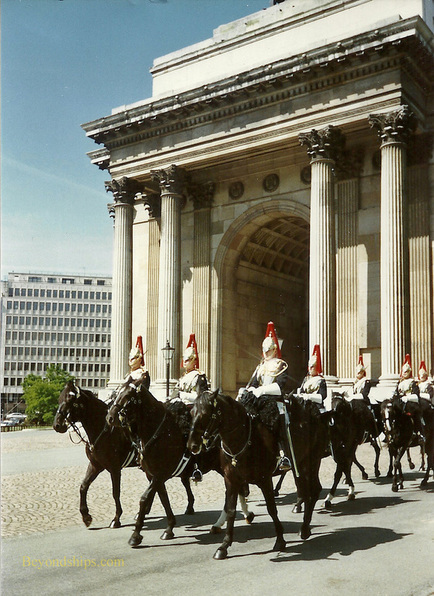 The guard is mounted at a ceremony at 11:30 a.m. and at 10 p.m. the traditional Ceremony of the Keys takes place. Naturally, the Guards provide the guards at the Queen's home, Windsor Castle. There is a changing of the guard ceremony. Furthermore, several of the sentry boxes are in areas open to the public and you can see the sentries being relieved during the course of the day. Once a year, the Guards regiments put on a massive ceremony called Trooping the Colour in Horse Guards Parade on the Queen's official birthday in June. It involves hundreds of Guardsmen including the Massed Bands and is a stirring display. The Queen and members of the Royal Family are present. The ceremony revolves around one of the regiments parading its colours before the assembled troops. As mentioned earlier, the original purpose was to let everyone see the colours so they would know where to rally. 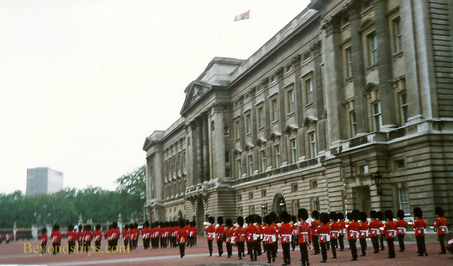 Today, the trooping is symbolic but is considered a great honor as the sovereign is present. Tickets to the actual ceremony are very difficult to obtain but there is a rehearsal usually a week before for which there is a better chance of getting tickets. Applications for tickets should be made in January or February through the Brigade Major of the Household Division which is headquartered at Horse Guards in Whitehall.